When you’re a young newcomer adjusting to life in a new country, your kitchen skills might not be on the front burner. It’s easy to fall prey to cheap, fast food, especially if most of your time is filled with learning about life in Ottawa, finding a job, going to school and so much more. That’s why the Catholic Centre for Immigrants started a Cooking Program for young newcomers. The pilot program ran this past summer and we are starting a second program this month. The goal of the program is to help young people learn about healthy eating and budgeting. Michael and Thao work with young newcomers and have heard about the challenges they face. “We noticed that most young newcomers do not have the time to cook a healthy meal compared to where they are coming from,” says Michael. “The young adults are busy with school, part-time jobs and still figuring out their new environment. As settlement workers, we recognized it was important to pilot a cooking program that would help young newcomers eat healthy while they are on budget, too,” Thao adds. With the help of the community that supports CCI, Thao and Michael got health professionals to facilitate the program. Dominico and Louisa were eager to help newcomers. Dominico is a professional chef who has many years in the culinary business. With his cooking skills, it was more than the CCI team had hoped for. Dominico focused on teaching the young newcomers on how to use utensils in the kitchen and best practices. Louisa is a nutritionist. Her knowledge on eating healthy on a budget was just what these newcomer youth needed. A budget is a crucial element to eating healthy. The cooking pilot program ran for five weeks. The targeted group was eight young newcomers between the ages of 17 and 25. However, there was a demand for the program and the group increased to 12 people with the youngest person 17 and the oldest 30. The different backgrounds and ages made it more interesting. There were a couple of 17-year-olds who were able to teach how to cook some of their traditional home meals to the 30-year-old. The newcomers came from Burundi, Japan, Peru and Iran. As a result, the cooking class took on an international flavour. 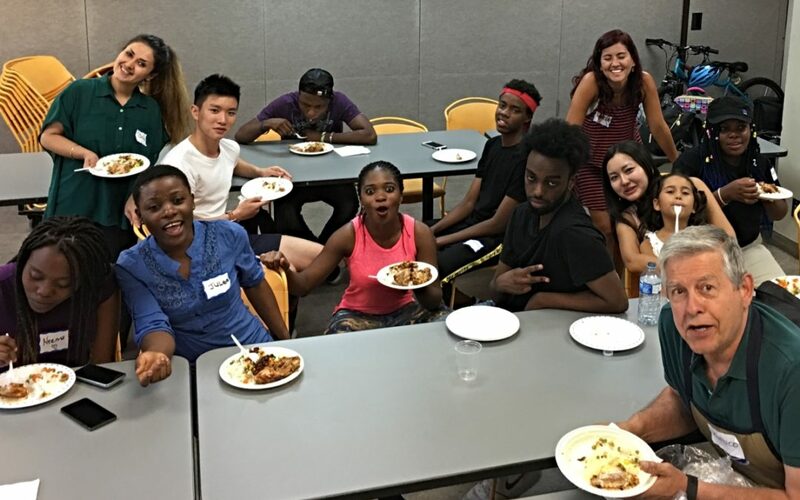 In addition to learning how to navigate the kitchen and cook healthy meals on a budget, it was also an opportunity for everyone to make new friends and socialize. The cooking class quickly became a social activity as well as an instructional program. Louisa showed the youth how to use apps such as Flipp and Aile 51. These applications focus on budgeting, coupons and specials. The youth also got out of the kitchen with a trip to a grocery store. The youth were tasked with visiting different stores to compare prices while focusing on nutrition as well. The goal was to find a store that combined nutrition with good prices. They also learned different ways of making food last, which in turn helped their budgets. Louisa taught them how to use leftovers to create a second meal. For example, leftover rice can be mixed with onions and to make rice fritters. Not only did they put the leftovers to good use, but they saved some time creating the meal. “On a typical day we focused on where to shop for nutritional meals on a budget,” she adds. It wasn’t all theory, though. Young newcomers were given tasks during each class such as washing and cooking vegetables and cooking together. Shiho Kato, one of the participants, who is from Japan, said the program helped in her personal life as well. As a young wife, Shiho says the Flip app helps her budget for the family’s food. It also helped her learn how to eat healthy.